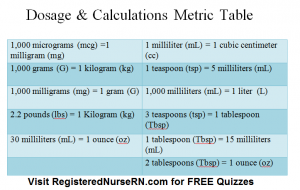 This is a printable metric table for dosage and calculation quizzes. Print this metric table off of your printer and have it handy while you watch the video series. The metric table is in Microsoft docx format. Simply click the picture below to access the metric table.